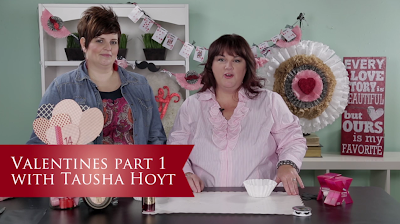 WATCH MY VALENTINES episode HERE on My Craft Channel We sure had filming this episode and Tausha proved on camera that not everything crafty comes natural to her. to 5 1/2 x 7 1/2". 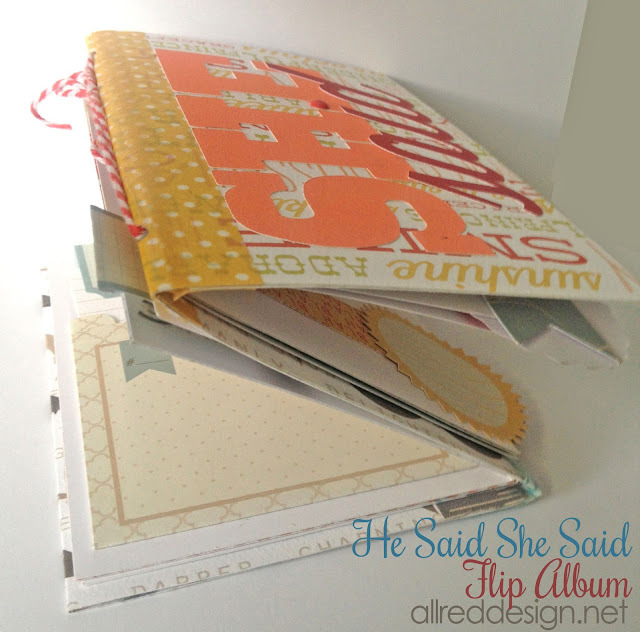 Fold all in half and punch holes. This shows both the "HE" and "SHE" sides of the album. anything except the subject line with my name in it. I shot out of bed and started hyperventilating and giggling at the same time. I was beyond thrilled and excited to see that both myself and My Craft Channel were being featured!! Then a quick panic of "oh crap, I haven't updated my blog this week" shot through my head. So I thought I'd say HI, welcome and link you to a few things. First, you MUST follow me on Pinterest...you see I'm addicted and I think you will find what I pin and feature on my Inspired by Pinterest show worth your time (wink). Follow me here. Someone recently asked me "why do you have so many jars in your craft room." 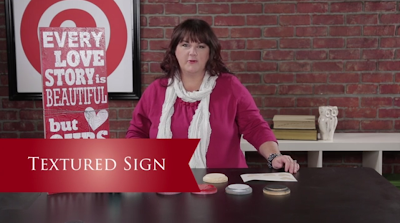 Well I am a firm believer as a crafter that "if I cannot see the craft supplies I own, I will not ever use them." So boxes and containers that might look nice on the outside and hide what is inside just do not work for me. I open them up years later to reveal supplies that I've probably purchased two or three times not realizing where my original stash is. So I love organizing by "Jar". I think they're beautiful will filled with pretty supplies and I can see what is in them from a distance making it much easier to use. 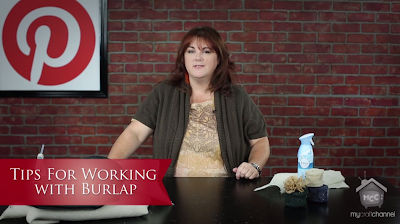 I've tried a ton of different ways to store my craft supplies over the years and this is what works best for me. 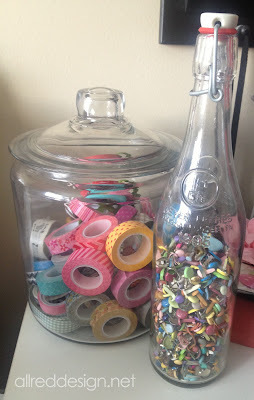 So I'd like to share some fun Storage Ideas Using Jars with you this post. I'm so beyond thrilled to announce that the new Creative Spaces Volume 2 is finally available for purchase. You might remember that I announced I'd be part of this amazing idea book in my Announcement post. Then not last week I shared a fun blog post showing you a little bit of the Behind the Scenes in this post. But I was even more thrilled to see my photo and my craft space in the actual magazine. Did I mention after seeing the first issue it was my goal to make it into the next one. Thanks to Megan Hoeppner and the Creating Keepsakes team, I actually accomplished a GOAL!! Here's some posts about my space that are not things that were featured in the Creative Spaces article. First off, I love using Vinyl to personalize my space. 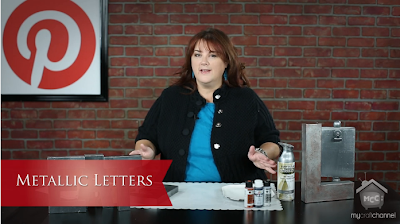 Be sure to check out how I did that in my Creative Ways to Use Vinyl for Home post. Now that you've pulled your holiday decorations down, you're probably wondering what to put up next. 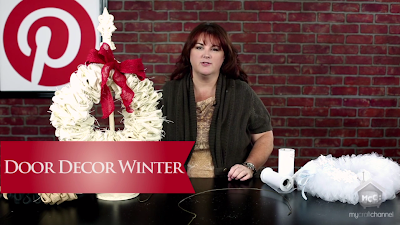 Check out my latest "Door Decor" episode where she'll show you a couple of different ideas for winter type wreaths using either tulle or burlap and a wire hanger.